It is in Mahayana, the dominant Buddhist tradition of East Asia, that the Medicine Buddha first appears. Veneration of this Lord of Healing became one of the most popular and widespread devotional groups. As Mahayana Buddhism spread throughout the Far East, it took with it Ayurveda, the sacred medical system of India meaning the science of long life," and the worship of the Medicine Buddha. The spread of Mahayana to China, Japan, and the kingdoms of Southeast Asia had a benevolent effect on public health. Hospitals, leper wards, and dispensaries were established in the larger monasteries, and were supported by income from "compassion fields." Perhaps nothing better illustrates the union of religion and medicine in Buddhism than the fact that the greatest of the Mahayana philosopher-saints were also great physicians, who wrote important medical works. According to the Tibetans, all medical knowledge has a sacred origin and is ascribed to the wisdom of the Buddhas. A measure of the high regard with which physicians were held in Tibet is shown in the title accorded to the greatest ones among them, an epithet for bodhisattvas: "The All Knowing One." Ideally a doctor was expected to practice compassion at all times, and equally towards all beings, to perfect his skill for their sake, and to remember always that a physician is a representative of the Medicine Buddha and the holy lineage of medicine teaching. Astrologically, the day of the Medicine Buddha is the eighth day of the lunar month. At that time, his power and that of all the healing deities is said to be especially strong. This is when rituals for healing and for making medicines are performed. 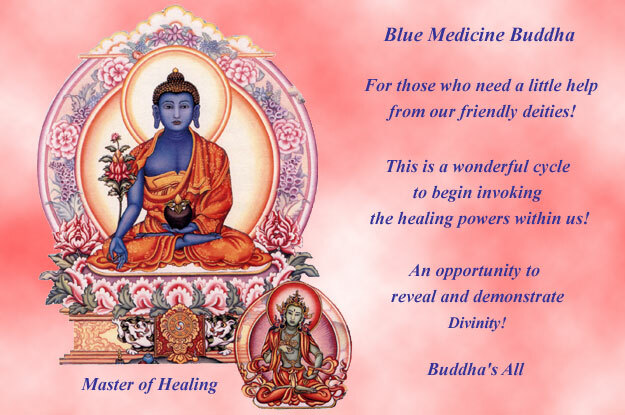 Anyone who wishes healing or knows of those who do can practice this meditation on the Medicine Buddha. First, find a quiet and comfortable space. Then, while breathing deeply for a few moments, relax and empty your mind. In that void, picture the Medicine Buddha, radiant and translucent blue, holding the myrobalan plant in the fingers of his right hand, which is extended on his knee in the gesture of giving. His left hand rests in his lap and holds a begging bowl filled with healing nectar. He is dressed in the three monastic robes and sits in the full lotus posture on a thousand-petaled lotus, which itself sits on a jeweled throne. See the space around you as a beautiful landscape holding objects of offering, everything that is beautiful and pleasing to you. Mentally give all of the most precious offerings to the Medicine Buddha. Invite Him to bestow his blessings and to sit on your head. Pray that he bestow his healing power upon you. Then see it radiate out to those others you know who need healing, and see it flow out to the entire Earth. From the heart center of the Medicine Buddha, see rays of light as bright as one hundred rising suns radiate into yourself and others, dispelling disease and suffering. Bask in the light. Afterwards, visualize yourself and all beings dissolving into a state of emptiness. Try to remain in that space free from thought, mingling with the state of the Medicine Buddha's mind. The most important aspect of this meditation, the essence of the healing practice, is to have strong selfless compassion for others, and to have fervent trust and confidence. May these ancient teachings bring you enlightenment, and may you share it freely with those around you. Blessings!